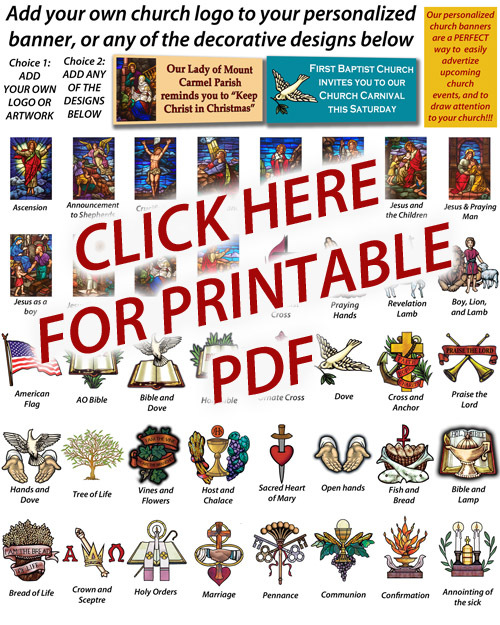 To advertise special occasions, holidays, and other church events. Add your own wording to your banner. Quick turnaround time! *Church Logos ARE accepted, we simply ask that the file you send to us by email be clear and workable, should the file need cleaning or adjustments before producing, a slight artist fee will be added. We accept PDF, TIFF, JPEG, and illustrator vector files. 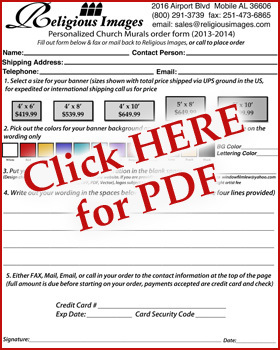 Simply fill out your wording in the provided area on the order sheet. Try to get your point across in as few words as needed. Space on the banner is limited depending on size chosen. 5. You can either fax, mail, or call in your order to 800-291-3739. Turnaround time is generally 2 weeks, rush ordering is available.